The Eat Real Festival, in it's third year, seems to be hitting its stride. It's a great concept, a celebration of locally produced street food, with a beer shed featuring a good selection of Bay Areas breweries, held every year at Oakland's Jack London Square. Last year, the festival seemed a bit sparse with few seemingly authentic street food vendors, and a few decidedly non-street food vendors selling things like frilly cupcakes and creme' brule. This year, the crowds were decidedly bigger, and street food definitely ruled. It's was a great opportunity for Linda and I to try some local beers, then go out and try a little of this, a little of that from the bite size servings the various street vendors were serving, before going back and trying another beer. Repeat as desired. Of course, any taco truck advertising "Kung Fu Tacos", described as containing the spirit of Bruce Lee, is going to get my attention. While they didn't cause me to exclaim "waaaaaaaaAAAAAAAHHHHHHHHHHH" and deliver a flying kick, the Asian marinated chicken and Mu Shu vegatables worked pretty well in a taco. And then there were those Philippine pork sliders Linda and I enjoyed. Somehow, this melting pot cuisine where Asian foods are served in Latin and American methods of tacos and sliders seemed natural and unforced. But let's talk about the beer. Plenty of Bay Area breweries could be found at the beer shed, which supported no fewer than 40 taps. Every hour, a different Bay Area brewer was on hand to pour their beer and talk about it. I wasn't able to uncover any profound secrets from any of the brewers, but there's something about talking directly with the person responsible for the brew. So here's a few notes of some of the more notable, at least to us, beers we tried. This somewhat rich tasting, dark brown colored ale has a strong rye presence. The rye blends well with the roasted malt, and there's this slightly herbal and astringent finish. Not a lot complexity here, but with a name like "Rye'd Piper", you would expect big rye flavors, and this beer delivers. Mission accomplished. Social Kitchen Brewmaster Rich Higgens describes this as a table Belgian Ale. This was has a light roasted chocolate a fig character, with a little spicy character from the Belgian yeast, and yet this flavorful, complex brew checks in at 4.5% abv. Nothing like finding another nifty session beer. Ondoonata is a Sacremento area brewery that opened last year, and after tasting this effort, it looks like they are going to be around a while. Their Saisson is a little lemony, slightly bready, and a little spicy peppery finish, all adds up to a great, refreshing summer beer. A friend and I are brewing up The Bride's Ale for my upcoming wedding, which was dry hopped and bottled last weekend. In case you didn't know, the word "bridal" comes from "The Bride's Ale", an old English tradition where a special beer was brewed for the bride in celebration of the wedding. Linda, my wife to be, always enjoyed the hoppier beers, so it seemed appropriate the her Brides Ale would be a dry hopped IPA. We think it's going to be a good one from the samples we took going into the bottles. There's a nice caramel note to the malt, a smooth bitterness, and a nice floral hop bitterness that matches with the brew's aroma. So all we have to do is make sure the bottles are clean, store them in a cool place with little temperature variation, stand back and let the residual yeast do its thing with priming sugar inside the bottles. If only marriage were that simple. Linda and I have over eighteen year combined marriage experience, so we can no longer claim we had no idea what we were getting into. We've been living together for a couple years now, and she's great for me and my kids. I'm pretty damn lucky. She's smart, attractive, funny, and does a reasonably good job putting up with all of my crap. But while you can control the brewing process, you can't control what life might throw at you, and yes, this could turn into another train wreck. But hey, part of taking the marriage leap is saying "I love you so much, I want to take this relationship to the next level, even that might result in complete disaster." Just like brewing and running, all you can do is your best effort to make it turn out for the best. I've survived bad beers, plenty of bad races, and even my last marriage. So I really have nothing to fear, and have pretty good feeling about this one. And at least there should be some good beer at the wedding. One of life's more fruitless tasks is trying to find new and interesting beers at an airport. Amid the Bud, Bud Lite, Coors, Coors Light strangle hood the big boys have on most cramped airport bars, usually something Sam Adam's Boston Lager or Widmer Hefeweizen can usually be found on tap somewhere. And as a fellow Bay Area blogger found, it's hard to find an IPA in an airport, even when it's located in a city with a great craft brewing community. So it was no small thrill when I discovered a great Double IPA last week awaiting my flight back home. And at what airport could one discover a great Double IPA? Would you believe Salt Lake City's? 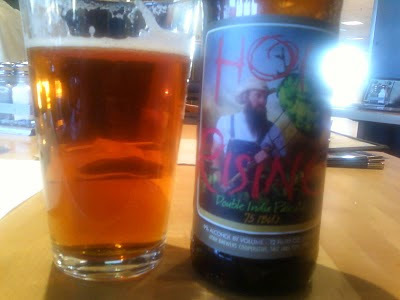 Yep, smack dab in the middle of one of the most alcohol adverse states of of the Union is a Squatter's Brewpub at Salt Lake's Airport, and I was fortunate to find their excellent Hop Rising Double IPA there. There's lots of big floral and citrus hop flavors, with a dominant note tangerine in this one. The malt side of the brew held it's own, with a slight caramelly character to it, and at 9% abv, this is an intensely flavorful brew, that isn't overly aggressive or downright assaulting, like too many Double IPA's I've tried. Don't let anyone tell you there's no good beer to be found in Utah, or in an airport for that matter, either. Talking like a pirate is one of those things that's pretty entertaining for about 20 seconds, and then gets really annoying pretty quickly after that. So I won't attempt to write like a pirate, and spare you the tedium of reading something barely readable. Of course, most pirates were probably illiterate, or wrote in languages barely recognizable today. And they probably didn't go around saying "Aaarrr! ", either. So I'll get to the point and tell you the Black Ship Pirate Stout, from Randy Mosher's great home brewing book, Radical Brewing is an absolute keeper of a recipe. It's my first "Damn, did I brew that?" moment in the six batches I've made since starting home brewing a year ago. Here's the recipe, from page 200 of my copy of Radical Brewing. At end of boil, add 1.0 ounce crushed coriander, 1.0 teaspoon of allspice, and 0.5 teaspoon of ground black pepper. Post fermentation, zest of an orange or tangerine soaked in vodka for 24 hours, and added at bottling. -There's an all grain recipe for this as well in Radical Brewing. I just haven't taken the all grain plunge yet. -I actually ended up using Fuggles as the 90 minute bittering hop, as a substitute for the Styrian Golding, since that's what they had at my local home brew store. 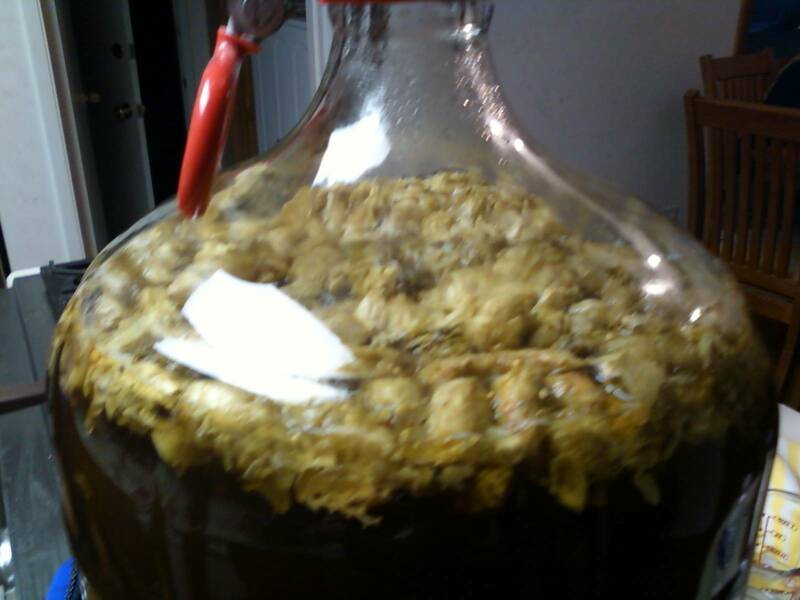 I used Tettnanger hops at 30 minutes, since I picked up the wrong package. Mosher describes Tettnanger as a great aroma hop for wheat beers, so I was a little concerned how this would work out in a completely different brew. I say it worked out all right. -I used orange zest for this recipe, but would like to try tangerine next time,. My greatest fear brewing this was that all the different additions, the molasses, four ounces of hops, and the different spices would produce a harshly bitter and cluttered brew. It actually turned out surprisingly smooth and drinkable, with a slight sweetness and spicy zip, the molasses noticeable but hardly overwhelming, and everything blending nicely into all the roasted malt. The orange zest gave it a really nice citrus aroma. Talking like a pirate gets old really fast, but I could drink this all day. Having spent last week in San Diego, it only seems fitting that the Beer of the Month of August should come from this great brewing region. And so I bestow this upon Stone Brewing's Saisson de Buff. Saisson de Buff is one of those collaborative beers that were all the rage six months ago. Brewed by Greg Koch of Stone Brewing, in collaboration with Dogfish Head's Sam Calagione and Victory Brewing's Steve Covalesky brewed with parsley, sage, rosemary, and thyme. Back in 2003, this trio formed an organization called BUFF, Brewer's United for Freedom and Flavor, which met a grand total of one time, and quickly adjourned to a nearby pub to discuss brewing ideas tactics, amoung other things. All three breweries will take turns brewing the recipe at there respective locations, the version I tried having been brewed at Stone the past spring. It's one of those complex beers best explored on multiple occasions. The first thing that hit me was it's light, almost feathery mouthfeel. Then, a rich yeasty flavor kicks in with some clove spiciness and a little piney character, most likely from the rosemary. Finally a strong, yet smooth herbal bitterness finished the taste excursion. Somehow with all those strong, complex flavors, it remains refreshing and very drinakble. And there's no better place to explore Saisson de Buff and the many excellent beers San Diego has to offer than Downtown Johnny Brown's, where I savored this beer twice last week. It's a neighborhood sports-like bar, located just north of San Diego's Gaslamp district, where few tourists venture. You could also go to The Toronado-San Diego or The Neighborhood for a great tap list, but those places just seem to have a manufactured trendiness to them. Johnny Brown's authentic character remains contemporary on its own terms. I guess you might have figured out Downtown Johnny Brown's is my favorite beer bar in the world. And San Diego is one of my favorite cities. The Inner Harbor running trail is some of the most picturesque urban running in the United States, and the great scenery always seems to enegize me on when I run there. There's always great, innovative, and memorable beers to be found. When I die and go to Beer Runner Heaven, it will be lot like San Diego. Once again, the beer blogosphere provided many unique, memorable personal perspectives, this time, about how beer connects us to places. In many cases, the "special" beers associated with special places where rather ordinary, even substandard, as most posters readily acknowledged. And as I anticipated, "place" clearly meant different things to different people. So let's jump right in to what everyone wrote. My session post was about my earliest beer experiences, as well as my graduate school years in Ohio revolving around Rolling Rock, which is now a troubled ABInBev product. My friend and co-worker Mary Russell shared her story about family fishing trips to western Lake Ontario, and her 12-year old son's earliest beer experiences. Mary wasn't the only person who considers the western Lake Ontario region a special place. John of BeerTaster remembers a small skirmish with the law in his younger days, but laments his old stomping grounds have become "plastic". The Beer Nut recently sampled some beers at an English-style pub in Paris, revisiting a place he'd been to many years ago. While the beers were a mixed bag, English-style pubs are particularly rare in France. Does that make the place special? The special place for Stan Hieronymus is Saint Benedictus Abbey of Achel, the beers brewed there, and the powerful effect silence creates. Pivní Filosof, the Beer Philosopher, writes of a school where 15 to 19 year olds learn to brew beer in Czech Republic, concluding that "In most countries this would be, if not highly illegal, at the very least terribly controversial. In the Czech Republic, it is tradition." The Reluctant Scooper writes that "a sense of place is greater than just physical location. It’s about interaction – who you’re with (or not); what’s happening (or not); what you choose to do (or not)" before revealing a surprising "place" that's revolutionized his attitude toward beer. Kudos to The Bottled Llama from Kingman, Arizona, who added the extra dimension of time to their discussion of beer and place. Alan of A Good Beer Blog has written on this session topic before from many different angles, and helpfully provides the links to his previous works. For Michael Stein of Beer Made Clear, the Southampton Publick House and Brewery in East Hampton, New York, is a place not only of his not only his roots, but greed, sacrifice, and where "the “haves” and the “have nots” both spend time on the beach", and is the subject of his post. Jay Zeis of A Beer in the Hand is Worth Two in the Fridge, Yuegling Lager brings back memories of his hometown, where he and his friends "shared many a beer on the front porch talking about religion, politics, girls and sports." Mike Lynch of Burgers and Brews writes about his personal connection to McSorley's Old Ale House in New York City, and admits if it "were any other dive, I’d rip it a new one on Yelp". With the ambiance of "old wishbones dangling from a light fixture" that "have collected so much dust that they have formed stalactites (stalagmites? )", and beer poured "by a barkeep with a black trashbag tied around his waist", it sounds like a place I've got to check out! Jon over at The Brewsite fondly remembers his days at Spokane's now defunct Birkebeiner Brewing Company in the 90's, as it was an inspiration during a time of his discovery of craft beer and homebrewing. Jay Brooks enjoys visiting breweries to taste beer from it's souce, explaining that "I do love the feeling of being in a brewery — or being with the brewer, or some other intangible, but I inevitably get the sense that that’s the beer’s home." Once again, thanks to all who participated, and we look forward to what Carla Companion, The Beer Babe has in store for us for next month's Session. My friend and co-worker Mary Russell wrote a contribution for this month's Session, which I'm posting here. In the third circle of my life mandela, I married an Episcopal priest (why that little detail matters will become clear) who rarely shed his roles as priest and psychotherapist (I almost left the 'therapist' off that last word). However, my father introduced the two of us to his favorite place to fish, in the land of lakes in Eastern Ontario. He'd gone there for years with friends to fish and be one of the guys; my mother didn't go for outdoor activities, so it was his place. So new husband John and I ended up buying a 45 year old house with four bedrooms, just inside (but private property) the lovely fishing 'resort' called Kirk Kove. Our house was up on a small hill and the screened porch overlooked the lake and we both felt a bit like the king and queen of the hill. And John was no longer trapped in his roles. We'd go for several weeks each summer, sometimes not all at once, and the kids (4 of 'his', 2 of 'mine') grew up as a 'Kirk Kove kid'--definitely an honorific, and they learned to water ski and to survive the jump from Tarzan Rock. Every Sunday that we were there, we'd pack at least one boat (we had a 16-ft fishing boat with a center console, “Tramp”, and my Dad had a 12- or 13-ft aluminum boat) with picnic gear, a grill, lawn chairs, large plastic bags to gather trash that uncaring people had left; John would take his Communion kit, Bible and Book of Common Prayer, and we'd set out for Church Island, about a 15- minutes ride in Tramp and almost twice that in Dad's boat. Once there with unloaded boat, settle in, set up what needed setting up and the kids were sent to gather their offering for our Eucharist. On one side of the island was a large flat-ish rock that served as an Altar, and several stones that provided adequate seating for all that were there. It was always far more meaningful a time in church than at any other place. The were cathedral- tall conifers, the clean, pure air, and the sussurations of the lake transformed the humble island into a holy and deeply spiritual place. Wait, you say, wait! I thought this was supposed to have something to do with beer! Where's the beer?! O impatient readers! To tell a good beer story, one must first set the stage. How else would you appreciate the situation, if you cannot imagine yourself there. So, back up, put yourself on that island, having completed the Eucharist, and now you're ready to eat. Well, almost ready. The fish have to be caught. So, John and the kids went to get lunch while Mom (me) stayed behind and got the accompanying food out and usually had time for a short nap. Boy, there's nothing like lying under the trees, dappling light and whispering pines for company, hearing an occasional voice from the boat that told me a fish had been caught. Once enough were caught, they headed to shore and John fileted the catch. At this point it was time for a beer for the two adults and soda for the kids. We drank either Labatt's Blue or Molsen's Golden, both purchased at the beer store in Canada, where the beer bears little resemblance to what's exported to the U.S. Meaning it's far better, with little higher alcohol content, and an indefinable 'betterness', perhaps the water. Add to that the place, the atmosphere, the odor of frying fish that had just been caught, and you might reach nirvana! Well, I'm allergic to fish, so I'd bring a hot dog and feel just as blessed, but of course I wasn't allergic to beer. One Sunday after we'd been going to Church Island for several years, I realized that we'd forgotten to include a church key, so we couldn't open the bottles of beer. OH NO!! HORRORS! It was at least a half hour round trip back to the house, closer to 45 minutes, and we couldn't wait that long. We were starving! Lunch was cooking and almost ready to eat! Scott, the youngest of the bunch of kids and my second son, saw a light bulb go on over his head, ran to his tool box, and held up a church key! We were saved!! So I did the unthinkable for a parent of a 12 year old boy—I gave him a bottle of Blue to drink. The whole bottle. Then I asked why he carried a church key! So—Labatt's Blue will forever have a special place in my heart. It was what I drank at Church Island, it was what I drank when John and I sat out on the porch rehearsing our folk songs for the next Talent Night at the Kove rec room, and it was what we took in the boat when we went fishing anywhere in the lake, keeping it cool in the lake as we fished. What's funny is that I have no memory of ever feeling really high when we were there at Kirk Kove. Not from beer, anyway. I can't get Labatt's in California, but whenever I go back to Western New York, I belly up to the bar at Scott and Patti's Stockman's Tavern, and I treat myself to couple of drafts of Blue or Blue Light. Oh, man, life is good! This month's Session, is about a special place, and the beer or brewery that connects you to that place. Here's my contribution. I know exactly what my first beer was, I just don't remember drinking it. My first beer was Rolling Rock, and I was just a few years old, growing up in the small college town of Bowling Green, Ohio during the 70's when my dad gave me a carefully administered sip of it. Dad rarely drank anything besides Rolling Rock, and back then when there were far fewer breweries in the US, this was supporting your local brewer, even if the Rolling Rock brewery in Latrobe, Pennsylvania, just east of Pittsburgh, was about 300 miles away. Dad didn't drink beer too often, but on Saturday afternoons, a glass of Rolling Rock was one of his small treats and he'd let my sister and I try some. Like most kids at elementary school age, we were curious how beer tasted, but didn't particularly like it once we tried it. Dad later told me these tastings were his way of trying to demystify beer to prevent us from abusing it later in life. Dad taught us that beer was not some forbidden fruit, but something to be savored and carefully enjoyed. These days, we call that respecting beer. I still remember Dad's excitement when Rolling Rock's spring seasonal Bock showed up at the State Liquor Store each spring. Seasonal beers in the United States were rare back then. Spring was basically when the snow melted and there were only a couple months of school left. But it was also the time Dad started drinking Rolling Rock Bock instead of their usual lager and telling me all about the spring tradition of Bock Beer, which barely interested me at the time. As the 70's ended, our family moved from the small Ohio town to the big city of Chicago, but so many small things from that time in Ohio remain etched into my brain. The lessons of supporting your local brewer, respecting beer, and a connection to seasonality of beer styles are all a part of my childhood experience growing up in a small Ohio town. I didn't think much of any of this at that time, but I carry these memories with me to this day. Nine years later, I came back to Ohio to attend graduate school at The Ohio State University. And while that meant a lot of late nights studying, struggling through nearly impossible problems, and long hours in the lab, it also meant late night poker games and going out to seeing quirky bands at clubs with friends. And the beer of choice when we cut loose from the hard work was Rolling Rock. It was the early 90's, and beers like Sam Adams starting showing up on grocery store shelves, Ohio having rid itself of the prohibition relic of State Liquor Stores. And while I started trying the new craft beers showing up in grocery stores, Rolling Rock was still the "local" brewer in Columbus. The tap list at most bars was limited to something like Bud, Bud Light, Coors, and Rolling Rock. And yes, for some reason, Rolling Rock just tasted better than those other lagers that simply weren't a part of my home. Rolling Rock had an identity with the eastern edge of the Midwest, and Coors, Miller, and Budweiser seemed foreign, even if there was a Budweiser factory in Columbus. Now 20 years later, I live 2,000 miles away from Ohio in Northern California. My curiosity in craft beers has turned into a full blown hobby, and my local brewers are all the great Northern California breweries. Mega brewing conglomerate Anheuser-Busch bought Rolling Rock in 2006 and almost immediately closed the Latrobe brewery and moved production to Newark, New Jersey. I recently tried Rolling Rock, and found it to be totally undrinkable, nothing like I remembered it back when I drank it back in Ohio. Maybe Rolling Rock just was never very good. Maybe I simply look back on the beer during those idyllic days of my childhood and graduate school with misplaced nostalgia, rather than a realistic understanding of what the beer was really like. But I can't help being troubled that the beer that created my first, lasting impressions of what beer embodies, a beer that identifies me with Ohio, and in a small but highly significant way, the beer central to experiences that will last me to the end of my life was kidnapped from its home in the Midwest and is now pimped from the streets of Newark with the awkward come on "Born Small Town". Few are buying this ridiculous line, and sales of Rolling Rock are declining, with little chance this beer will ever find its way back to its true home. A part of me is lost forever. It towers over the city of Belmont casting long, ominous shadows. Startled airline pilots swerve out of its way as they land their aircraft onto nearby San Francisco International Airport. UFO sightings along the San Francisco Peninsula have tripled. And if you've driven down Highway 101 near the Ralston exit and looked westward, you can't help but see it towering over the small industrial park where Devil's Canyon Brewing is located. Just what is it? Linda and I decided to spend last Friday solving this deep mystery and grab a couple pints at Devil Canyon's Brewing Beer Friday, an open house Devil's Canyon holds the last Friday of each month. Turns out this shimmering tower of metal is a humble grain silo. I spoke for a few minutes with Daniel Curran, Devil's Canyon's VP of Sales and Marketing, who told me the new silo halves their grain costs, as they can now buy grain in much higher volumes with the increased storage capacity of the silo. Cutting costs by increasing volume? Well, that sounds something like a mega brewer ABInBev might do. But hey, craft brewing is a business, and as a business, any craft brewer to find ways to keep costs down to stay competitive, just like ABInBev. But since grain has a pretty long shelf life, I'm not too concerned about a drop in Devil's Canyon's overall product. But what is very un-ABInBev-like is that Devil's Canyon maintains and cleans all the tap lines wherever their beer is sold, making the extra effort and expense to maintain the quality of their product at the point of sale. Having experienced excellent beers such as Sierra Nevada Pale Ale, Sam Adam's White Ale, and Anchor Steam ruined by a stale cheesy flavor introduced as the beer flowed through a dirty tube into my glass, trust me, this is good to know. Linda and I also checked out Mayfield Brewing that evening, which is located in the same industrial park not less than 50 yards away. I've heard a lot about Mayfield, but never had the chance to check out their beers before, especially since the $30-$50 a bottle pricing was a little too steep for my recession limited wallet. The good news is they were serving 4-5 ounce tastings for a more affordable $5. Mayfield's claim to fame is aging their beers in used wine barrels, infusing a lot of wine and woody characteristics into their beers. For a couple of the beers we tried, this created an interesting, unique, and complex drink. But notice I didn't use the word "tasty", because with the Iconoclast Aurora, and Iconoclast Eclat, an Alt Beer and IPA aged in Zinfandel and Cabernet barrels, this process seemed to create a forced marriage of flavors and the resulting liquid seemed to have a bit of a identity crisis. Linda, a big IPA fan, really missed the floral aroma found in a good IPA, which seemed to be sucked out of the brew from the barrel aging process in the Eclat. There were no such problems with the Iconoclast Nocturna, an Imperial Stout aged in Syrah barrels. Maybe that's because Syrah and the chocolate notes of the Imperial Stout are a more natural pairing, or the smoky, woody, and vanilla notes that the brew seemed to pick up from the barrel aging effortless pair with the chocolate and coffee notes of the stout. No "acquired taste" required to enjoy this one, which was one of those beers that make you sit up and say "Wow!". Linda and I gladly spent $30 on a bottle of this stuff. Only about 25,000 people live in Belmont, and yet it's home to two craft breweries. I think we're going to like living here, despite all the strange goings on from time to time.